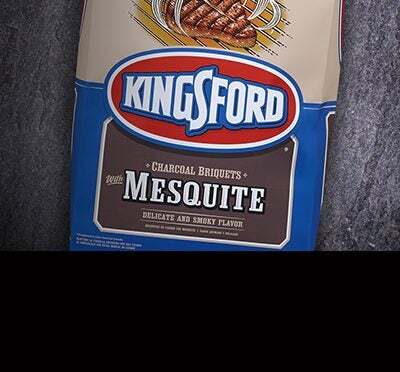 Kingsford® Charcoal with Mesquite gives you more of that smoky mesquite taste in your favorite barbecued foods. That’s because each briquet contains high-quality mesquite wood that infuses your food with an unbeatable smoky taste. And just like Kingsford® Original Charcoal, Kingsford® Charcoal with Mesquite features our signature Sure Fire Grooves® for easier, faster lighting*. Available in a 6.6kg bag. For Your Safety •	Never use gasoline to light charcoal. •	Do not add lighter fluid directly to burning or hot charcoal. •	Make sure ashes are cold before discarding. •	Barbecue away from flammable items, overhangs and trees. •	Store in a cool, dry place. •	California Proposition 65 Warning: Combustion (burning) of this product, like other cooking methods, produces carbon monoxide and other substances known by the State of California to cause cancer, birth defects or reproductive harm.